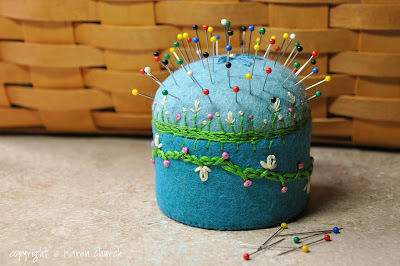 Since I have been doing so much sewing lately, I needed a pin cushion and came across this tutorial over at Wee Folk Art. I love their blog, and they have great tutorials with free patterns. Their blog is definitely worth a look. Just make sure you set aside an hour or two! 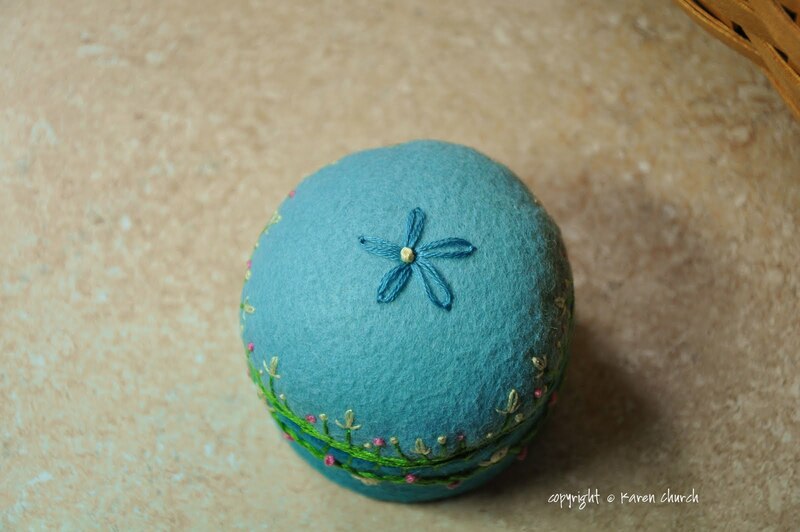 I ordered my felt from Wool Felt Central (20% discount when you mention Wee Folk Art), and as soon as it arrived I started on my pincushion. They have loads of colors of felt, and I was able to pick ones to coordinate with the colors on my sewing stool that I recovered. I love being color coordinated! :) I added the pink just because I love pink. I don't think I have embroidered anything since I was about 10, but it's just like riding a bike; everything came back to me. There are some great sites out there with embroidery stitches, and I checked a few out just to get some ideas. I embroidered the band that goes around the can before I stitched the bottom and tops on. The dome was stitched after it was attached to the can. You could stitch the top before if you wanted, but if you have a design that needs to be centered, it may end up a little askew. 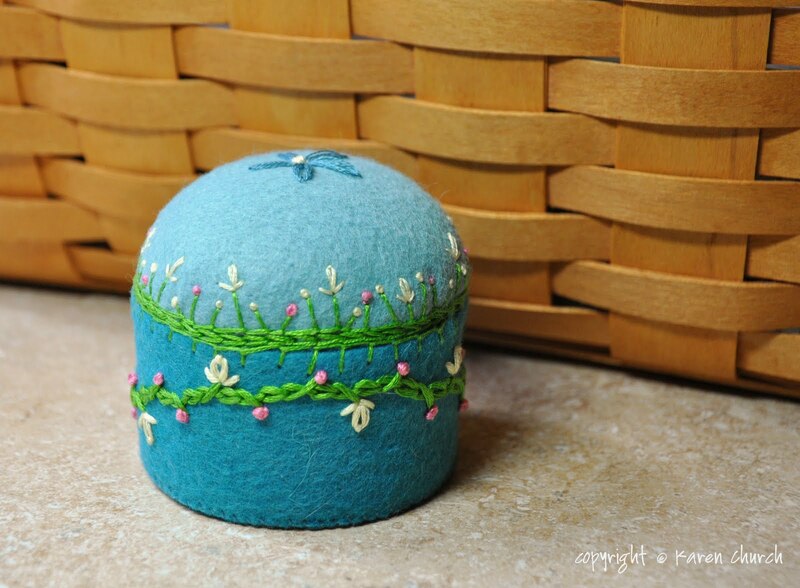 This was a really fun project and would make a great gift for anyone who does needle work. 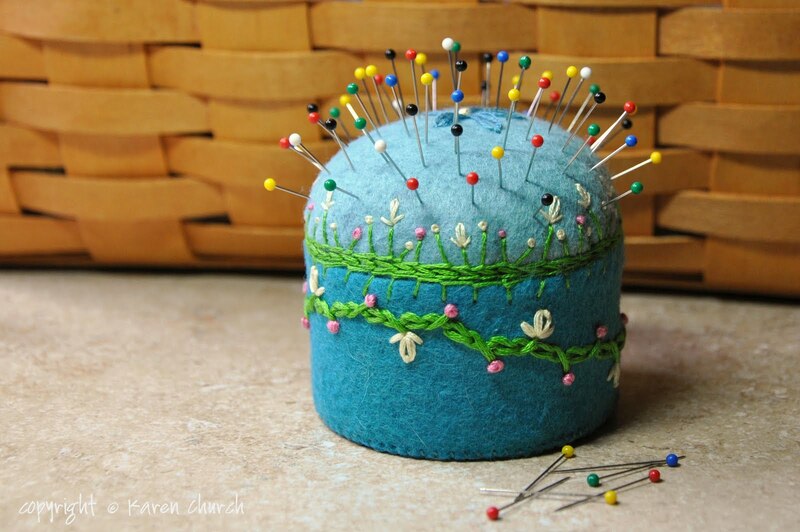 I used the 3 oz size tuna can for my pincushion, and it is just the right size for me. I may make another one using a bottle cap just because it would be so stinkin' cute. Oh too, too cute! Thanks for the wool felt site! Going to check it out! Stamps + Ink + Paper = Card!